A tuneful tale of time travel and theater. Why See Showtime With Shakespeare? 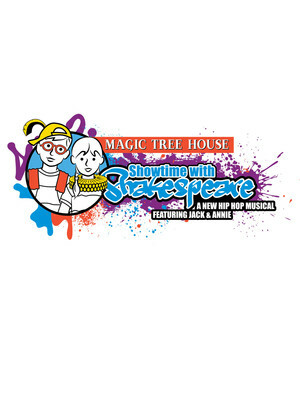 Based on Mary Pope Osborne's Stage Fright on a Summer Night, from her best-selling Magic Tree House book series, Showtime with Shakespeare sees daring adventurers Jack and Annie, transported to Elizabethan England where they meet none other than William Shakespeare, the world's most famous playwright. But Mr. Shakespeare isn't a happy man; some of the actors in his latest play aren't playing ball and are set to ruin the show. He risks it all when Jack and Annie step in and take to the stage - will it be his final curtain call, or will his audience rave about the performance? Find out in this highly original hip hop musical. Mary Pope Osborne's Magic Tree House book series have been translated into 33 languages, and have sold more than 135 million copies worldwide, making it the best-selling chapter book series of all time. This play is set to be a hit with all kids, parents and the whole family. Sound good to you? Share this page on social media and let your friends know about Showtime With Shakespeare at Capitol Center for the Arts. Please note: The term Capitol Center for the Arts and/or Showtime With Shakespeare as well as all associated graphics, logos, and/or other trademarks, tradenames or copyrights are the property of the Capitol Center for the Arts and/or Showtime With Shakespeare and are used herein for factual descriptive purposes only. We are in no way associated with or authorized by the Capitol Center for the Arts and/or Showtime With Shakespeare and neither that entity nor any of its affiliates have licensed or endorsed us to sell tickets, goods and or services in conjunction with their events.